Shake container before each use. To experience the full strength of OUTLIFT mix 1 scoop into 8-12 oz of cold water and drink 30 minutes prior to working out. When mixing with a shaker cup, use cold water. Hold cap and cup securely in hand. Do not shake vigorously as this causes pressurization. 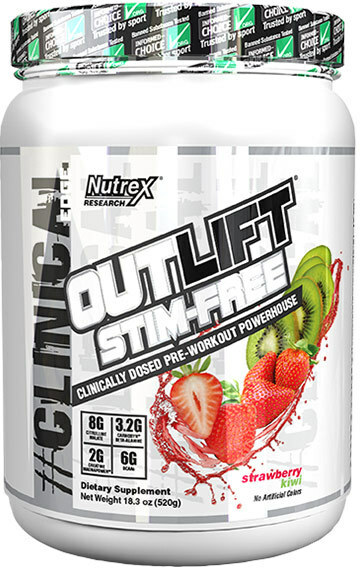 OUTLIFT STIM-FREE is the perfect option for those athletes looking for a fully clinically dosed pre-workout that offers all the performance benefits without the use of any stimulants. OUTLIFT STIM-FREE boasts the same fully dosed performance ingredients of the original OUTLIFT with the addition of Betaine Anhydrous and features Magnapower Creatine over standard Creatine Monohydrate. Whether you are looking to take a break from stimulants all together or need something to push you through grueling evening training sessions and don't want to be up all night, OUTLIFT STIM-FREE sets a new standard and gives athletes a serious alternative backed by solid science with a full array of proven ingredients! This clinically dosed formula primes your muscles for maximum pumps, more power and strength, greater endurance, faster recovery and less fatigue. Other Ingredients: Natural and Artificial Flavor, Silica, Sodium Bicarbonate, Sucralose, Acesulfame Potassium.